Acey, Ab & Mikah team together again for one banging cd. This time around there is no live band but there is plenty of dope production! Features a massive posse cut with Blackalicious and Latyrx! 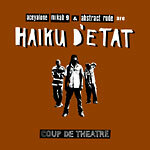 Includes a free DVD with Haiku d'Etat music videos, live footage, interviews.